Arteriole: The circulatory vessel that receives blood from the body's arteries. 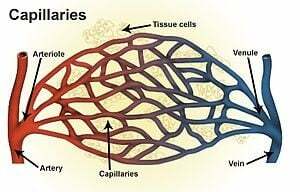 Capillaries: The smallest of all circulatory system structures, are the point at which the exchange of oxygen, waste materials and other things like nutrients occurs. Plasma: The major part of blood that contains plasma albumin which is a protein that enables and controls the osmotic pressure of the blood which enables oxygen, electrolytes, nutrients and hormones to the enter the body's cells and tissues and plasma albumin also enables the elimination of wastes from the bodily cells and tissues. Hemostasis: The clotting ability of the blood platelets to maintain blood volume stability with the prevention of blood loss with bleeding and hemorrhage. Simply stated, the circulatory system provides the body with fresh oxygenated from the heart and it removes waste products from the cells of the body. The circulatory system transports and supplies the body with oxygen, electrolytes, nutrients and hormones; it also controls the bodily temperature, the pH or acid base balance of the body, the body's resistance against infection, the clotting ability of the body and it eliminates and rids waste products, such as carbon dioxide which is the waste product of oxygen consumption, from the body. The human circulatory system (simplified). 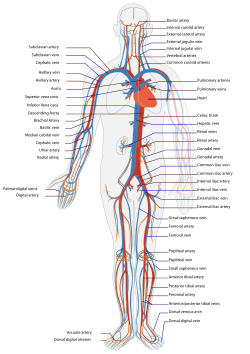 Red indicates oxygenated blood carried in arteries, blue indicates deoxygenated blood carried in veins. Types of blood vessels, including a venule, vein, and capillaries. 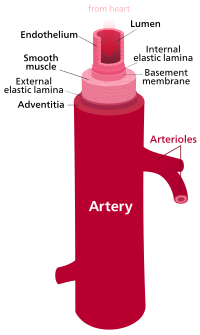 The sequence of the flow of blood moves and flows from the aorta and the left ventricle of the heart to other arteries, then to the arterioles and then to the capillaries, and then to the venules and then to the veins which return the flow of the blood to the vena cava vein of the heart, after which the flow from the aorta and arteries begins again. Arteries consist of several layers and muscle tissue that enables them to pump blood throughout the body after it leaves the heart. With the exception of the pulmonary arteries, all other arteries in the body carry only oxygenated blood to the body's cells. The pulmonary arteries carry and transport deoxygenated blood from the right side of the heart to the lungs for reoxygenation. Arterioles receive blood from the body's arteries. Arterioles, like arteries, also have muscle. The arterioles occur in the human body after the arteries and before the capillaries. Capillaries, the smallest of all circulatory system structures, are the point at which the exchange of oxygen, waste materials and other things like nutrients occurs. The thin walls of the capillaries enable these exchanges to occur. For example, the capillaries in the renal organ, or kidney, enable the elimination of waste; the capillaries in the lung pick up oxygen and they also remove carbon dioxide; and the capillaries in bodily tissues allow for the passage of nutrients to the tissues and cells of the body. As the blood flows from the capillaries, it enters the venules which are the smallest veins of the body. Venules carry and transport wastes and deoxygenated blood from the capillaries to the veins. Veins, like arteries, have three layers, however, in contrast to arteries, veins do not have the muscle needed to move blood back to the heart. Instead, it is the skeletal muscles of the body that push the blood back to the heart. The lymphatic subsystem, although considered part of the circulatory system, is quite different from the circulatory system described immediately above. The lymphatic system is closely aligned with the body's immune system and it also removes excessive fluid from the bodily systems. 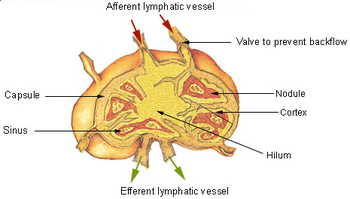 The lymphatic system vessels, unlike the circulatory system vessels, contain a fluid called lymph fluid, as contrasted to the blood within the circulatory system vessels. Lymph fluid in lymphatic system vessels contains white blood cells including lymphocytes. 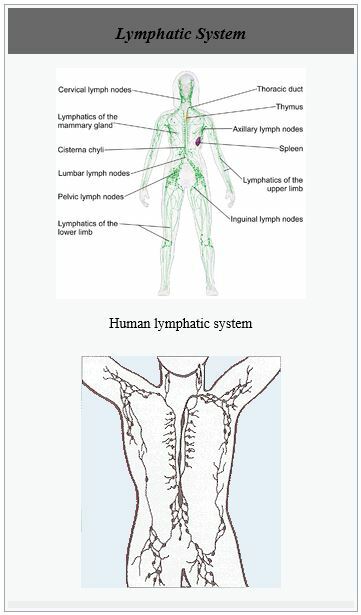 In addition to these vessels, the lymphatic system also consists of lymph nodes and lymphatic organs. These organs include the thymus gland, the spleen, the bone marrow and the tonsils. Lymph nodes are a collection or cluster of lymphatic tissue. These nodes are found throughout the lymphatic system and they serve to filter the blood as it travels throughout the body. Swollen lymph nodes can signal a disease or an infection. Many lymph nodes are found in the neck area, under the arms and in the groin area, although there are hundreds of them throughout the body. Blood is a bodily fluid that transports and delivers oxygen, electrolytes, nutrients and hormones to the body's cells and tissues; it also provides for the maintenance of a stable bodily temperature, the pH or acid base balance of the body, the body's resistance against infection, the clotting ability of the body and it also eliminates and rids waste products from the body such as carbon dioxide which is the waste product of oxygen consumption. The blood contains a large percentage of water in terms of the total volume of blood. Whole blood is a combination of plasma, water and blood cells. Plasma in blood is over 50% of the volume of blood and over 90% of plasma is water. The main component of plasma is plasma albumin which is a protein and one that enables and controls the osmotic pressure of the blood which enables oxygen, electrolytes, nutrients and hormones to the enter the body's cells and tissues and plasma albumin also enables the elimination of wastes from the bodily cells and tissues. Image of a normal red blood cell (left), a platelet (middle), and a white blood cell (right). Red blood cells, also referred to as erythrocytes, outnumber the white blood cells and the platelets in the blood; erythrocytes are disk like in shape, as shown in the picture above. The red blood cells contain iron laden hemoglobin which is the transport agent for oxygen to the cells and bodily tissues. Unlike other cells in the human body, red blood cells do NOT contain a nucleus when they are fully developed and mature. In addition to hemoglobin, red blood cells also contain glycoproteins which determine the blood type for individuals. The blood types are type A, type B, type AB and type O. These blood types will be fully discussed below in the section entitled Hematological System. White blood cells, also referred to as leukocytes, are part of the bodily immune system which fights off infections from pathogens, which are infection causing germs. When the white blood cell count rises, it is a sign of infection. See a picture of a leukocyte above. Unlike red blood cells, white blood cells have a nucleus and they are irregular in terms of their shape, rather than disk like as the red blood cells are. Platelets, also referred to as thrombocytes, as shown in the picture below, control hemostasis in the body. 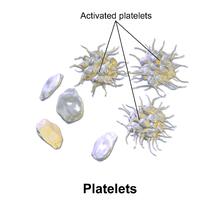 Like red blood cells and unlike white blood cells, platelets do NOT have a nucleus. The main purpose of the platelets is to maintain hemostasis. Hemostasis is defined as the clotting ability of the blood platelets to maintain blood volume stability with the prevention of blood loss with bleeding and hemorrhage. Hemostasis is enabled with the clotting process and the clotting factors which are found within the platelets of the blood; these clotting factors coagulate or thicken the blood when a blood vessel has been broken. For example, when a person gets a cut on their finger or a stab wound in the chest, the clotting factors in the platelets coagulate or thicken the blood and they stimulate the production of fibrin to prevent blood loss.